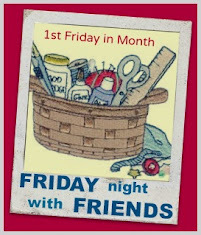 Seems all I blog about these days are Friday Night Sew In sign ups. Not that my life is boring......it's anything but. There has been so much happening here of late, and not all of it good....mainly family health problems and work. I promised myself that this year's blogging would be better than last year's. I said that last year 'flew' by in a flash....this year seems to have grease on the skates even moreso, don't you agree? I've decided as it's mid-year, I'm making a pact with myself to slow down and take time for stitching and blogging because it feels like there's a big chunk of my life missing and I want it back. That's what blogging and stitching does for me. I need some normality back to my hectic life, and if I don't schedule it in, I'm sure my levels of insanity will rise higher and higher and we don't want that! A quilting friend of mine passed away from cancer two years ago and her husband recently asked me if I'd finish a quilt she'd begun to quilt by hand. I felt honoured but I'm not one to hand quilt so I was pleased when he said he didn't mind how I quilted it, he would just be happy to wrap himself up in his wife's love and to 'feel' her one more time. She had begun to hand-quilt crosses through her nine patches and echo-stitch each pieced-section within each block and then again around the outside border of each block. She'd already done a couple so I finished them off, using my machine on a large stitch and the same coloured thread that she'd used, so you couldn't tell (too much) of the difference. I also stitched in the ditch around/through each block and stitched cornerstones in the four corners of the border fabric with perpendicular parallel lines of stitching around the border. I think she'd like it.....Milo does! I didn't really realise till I threw the finished quilt onto the bed how big it actually was. It turned out it was a king size. Our bed is a queen and the purple borders hung generously over each side. I'm very proud to have been gifted the chance to pay it forward for this lovely couple. I'm sure Bob will be snuggling up warmly wrapped in Gail's love tonight now the nights are getting colder, even up here in the tropics. 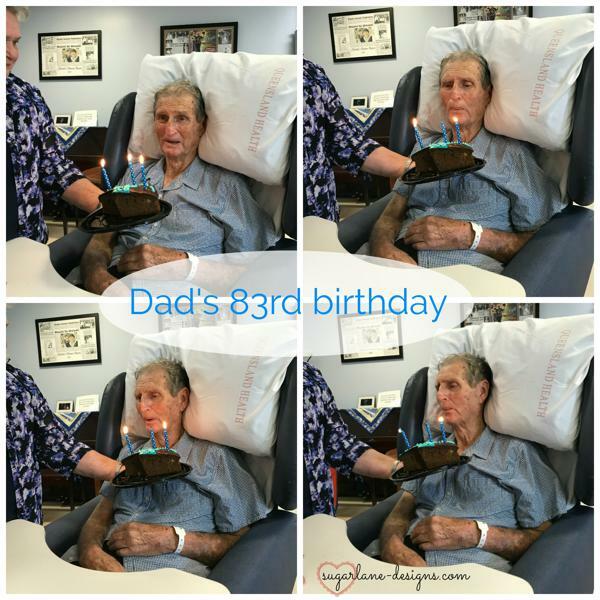 We celebrated dad's 83rd birthday at the beginning of the month. He'd had a turn a couple of weeks before and they'd told us to prepare to lose him that night....he didn't go anywhere but stayed on stronger than ever and here we are, celebrating another milestone with him. He even sang happy birthday to himself! Love this father-in-law of mine to bits! Now it's time to get ready for FNSI this month. I see I missed last month's draw so I'll do a double draw this month for two lucky FNSI-ers who will win a little something from me. Make sure you sign up below and let others know it's 'that time of the month'! Now for me, it's time for bed! Sleep tight and dream sweet dreams of your Friday night stitching with us! A big birthday hug to your FIL! 83 years is quite the milestone! Finishing that quilt is quite a tribute to your friend. I'm sure you felt her love in the blocks too. See you Friday Nite! The quilt looks wonderful - how special!!!! Yes time to slow down ....... this will be my last Friday sew in while living in Bundalong! A very special quilt and looks great. We all have to "take time to smell the roses".....sometimes easier said than done. I read recently "If you change Nothing then Nothing will change" and it made me stop and think. Happy birthday to your FIL. See you all on Friday night and I have BIG plans! It seems that the next 2 months for us are full of birthdays. Happy Birthday to your Fil. Life is hectic and we all need to stop occasionally to smell the roses. Looking forward to a bit of quiet sewing in my future. Hopefully this will happen on Friday night. What a month! Happy birthday to your father in law and much fun at Friday. This month, I will join again. I'll be joining in with a group of 16 at retreat for the weekend. Happy birthday to FIL & stitching to you. Yes we're do the weeks go ??? 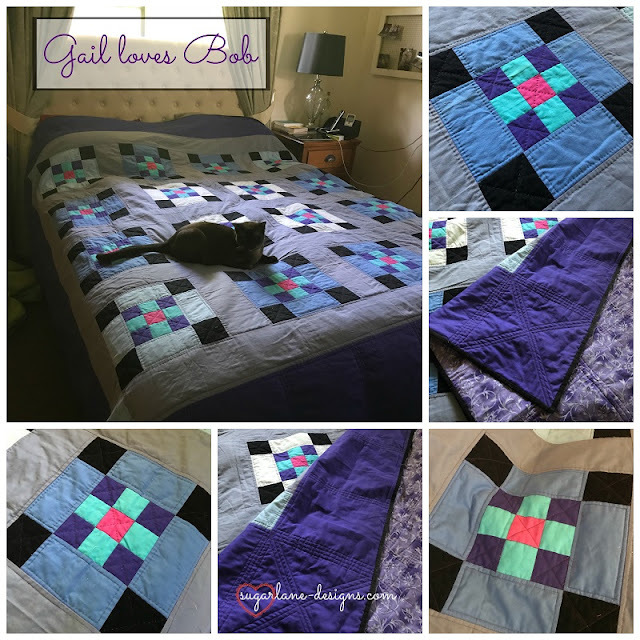 How nice to have been abble to finish your friend Gail's quilt for her hubby Bob. Looks fabulous. Pleased you were able to celebrate 🎉 your FILs BD. Nice cake 🎂. Good luck with fulfilling your desire to do more blogging and especially stitching, Wendy. Life can be hard and for me, my stitching is really my therapy. It is hard when life gets in the way of some of the things we love to do, like quilt, sew, and blog. I hope you can fit it into your schedule again. Happy Birthday to your father-in-law. And thanks for hosting FNSI. Happy Birthday to your dear FIL, Wendy and how lovely that you could finish the quilting on Gail's quilt for Bob - I am sure that he loves it and you for your labour of love. I know what you mean about blogging - it does fill a nice little niche in our lives and I hate it when I get behind on posting and reading blogs and yes, this year is definitely going by very fast! Thanks for the FNSI link up, my dear, look after yourself.